One of the easiest, best and relatively economical incentives to motivate valuable executives and employees is to give them ownership in your company through options to purchase shares of stock. Stock options are great for rewarding employees, contractors and other contributors to your business for their continued support, contributions and long-term commitment. They will feel the ownership, and enjoy the reward of staying the course and helping you to build your business. If you gave your employees the actual shares now, they would be immediately liable for income tax based upon the value of the shares today. With stock options, you are promising them that they can buy shares in the future, based upon your share price today… since you haven’t actually paid them anything and therefore there would be no tax liability. So, stock options are the way to go. Stock Option Builder is a software system that manages a collection of sample employee stock options template documents, professionally formatted in Word, that you can easily edit or reformat to your liking. 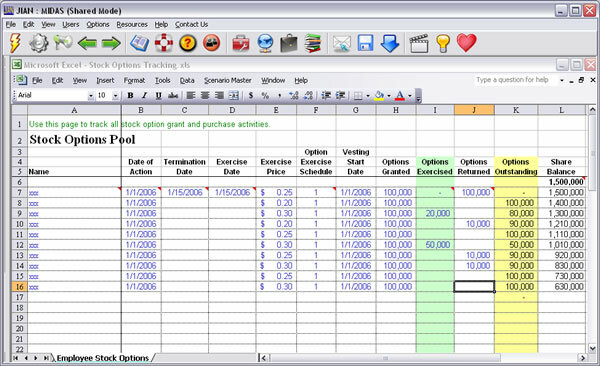 Stock Option Builder also includes a handy spreadsheet template in Excel for managing and tracking your executive and employee stock ownership and options — just fill in the variables and print. Dear employee… Here is the paperwork that says, “You get a piece of the action…” Read these documents, sign them, and file everything for the future — you will share in the wealth as the value of the company increases. It’s actually a formal letter explaining the contents of the packet (most of this product) that you are giving them. Use this Excel spreadsheet to list all of your shareholders as well as option holders. Keep track of when you gave the options, the option price, vesting—automatically calculates the balance of shares available for other employees and contributors. Track the details of your executive & employee stock options allocations — automatically calculates balances. There are no new programs to learn — Stock Options Builder is easy to use and works with your familiar Microsoft® Office software. Just scroll through each section and edit using your familiar Word or Excel applications. Experts’ comments throughout each section, in green, explain issues and make suggestions to help you do it right. You can add, edit and customize any document the way you like. Drag and drop sections to change the order. Check the boxes for each section you want to include. You can even add your own external documents, new sections and print to PDF. The JIAN MIDAS document assembly software enables you to easily add your own documents into the system. You can put your complete executive and employee incentive stock options compensation plan in place yourself for a fraction (a very small fraction) of the cost of having it written from scratch. Then have your attorney (please see a specialist) or our affiliated law firm review it for completeness. Stock Options compensation for your executives and employees—a piece of the action… “golden handcuffs”… managed your way.